Restrict/Ban Members to Send/Post Messages On WhatsApp Group:- Facebook Owned WhatsApp has now finally launched one of the best features to ban group members from posting messages on WhatsApp Group. WhatsApp has provided the unique "Super Power" to the Group'Admins to restrict group members from posting irreverent messages, photos, links, videos etc. Now group members won't be able to send such messages without taking the permission of group admins. If you were also the group admins of some "WhatsApp Group" and had been tired of warning to your group members against posting Gifs, Messages, Links, Voice messages etc without permission. Now you can restrict WhatsApp group chat to post admin-only. And you can prevent your group from posting unwanted messages by your group members. Being a group admin of a WhatsApp group. 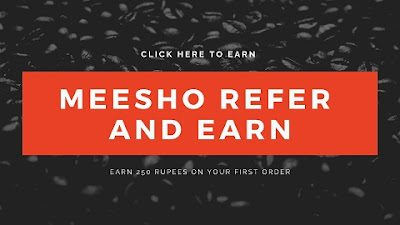 I had been tired of always reminding to the members that they are not allowed to send or post any links, messages, videos on that particular group which is nowhere related to the motive of the group which we have created for. But still, there are few members who are the culprits to spam the group for no reason. To ban such members from posting in the group. 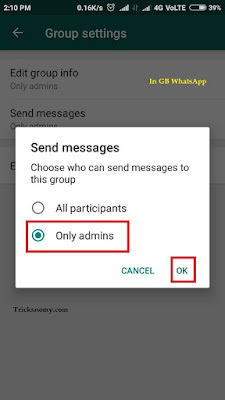 You can use this feature name "Send Messages" which you can find in your Group Settings and then "Choose who can send messages to this group" and choose "Only Admins". By selecting this option only group admins will be able to post messages on WhatsApp Group. WhatsApp has already rolled " Delete Messages For Everyone" feature that grant users to delete or revoke their messages before the time limit if the message was sent by mistake. By using this feature you can easily revoke your wrong sent messages. But as usual, we Indians try to juice up this feature by sending the messages and then delete it before reading those messages by the receiver to leave them in suspense. 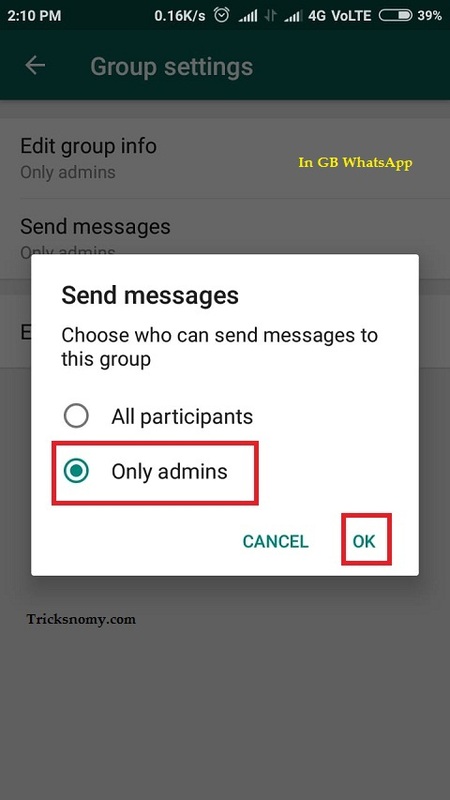 However, apart from this funny thing WhatsApp Inc just introduced some features for group admins and naming it as "Admin Controls" where an Admin can restrict members to change the group description to the admin only. WhatsApp's Admin Controls" features give the admin a restricting power to stop the group members from posting. By using this feature an admin can easily restrict or ban group people/members to send any spammy links or photos and messages. Using the same method you can create a WhatsApp group where only admins can send messages. Soon this feature will be available on latest WhatsApp Update. But if you want this feature for your group then we are going to share this little trick to get this feature of banning members from posting on WhatsApp group. If you haven't got this feature then you can try WhatsApp beta update. Now in this post, we are going to take the help of latest "GB WhatsApp Update". But before diving into the following steps. If you haven't tried the WhatsApp Payments Feature then go to this post that is get WhatsApp Payment Invite. How To Ban/Restrict Members To Send Messages on WhatsApp Group? So how you are going to ban/stop your group's members to send/post messages to your group. Even though you have warned them several times not to do that. But still, they post some irrelevant posts in the group. Now you can ban them easily by following the below steps. Here in this post, we haven't yet got this feature officially while writing this post. So we going to use GB WhatsApp and will download its latest version on our Android Smartphone. As we don't recommend to use GB WhatsApp personally but if you need this feature then you have to enable it via GB WhatsApp App. Later you can uninstall the GB WhatsApp. We also going to leave the link of latest GB WhatsApp App from there you can download it. So read the steps below. First of all Download the latest version of GB WhatsApp Download GB WhatsApp. After this register on GB WhatsApp app with your another number. Now you have to add this (GB WhatsApp Number) into your group by using your main WhatsApp Number that is your Official WhatsApp where you have created your group. After this made the admin of this new number in your WhatsApp Group. After that open up your GB WhatsApp and then there you'll see your group. Open the group and Tap on the Group's name and one more time. After this, you'll see some options, scroll down and you'll see "Group Settings". Click on Group Settings, you'll find the "Send Messages" option. Now Tap on it and you'll see two options to select, one is All Participants and another one is Only Admins. Choose the Only Admins option and you are ready to rock. Now only the admins will be allowed to send messages to that particular group. 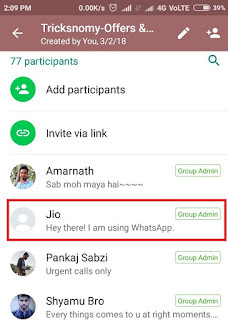 This feature of "creating the WhatsApp group where admin can send/post messages" is working now again. Since it was in the beta phase that's why some people were getting some error like "Can't enable this feature" using this GB WhatsApp Method. Now they are again able to use this feature for their Official WhatsApp group. Where they can allow only admins to send messages. Other group members won't be able to post anything except to see the messages posted by the group's admins. Finally! WhatsApp has started rolling out the "Send Messages" feature. You can find this feature now in the Latest WhatsApp Update Version. Using this Send Messages feature now any "admins can restrict members" to send messages. Group members can only see and read those messages but can't reply to those messages still they can contact any of the admins of that particular group. 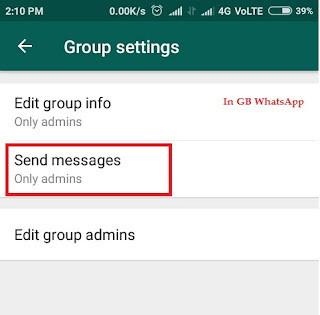 We have already shared the trick to enable "Only admins can send messages" using the GB WhatsApp Method. But now you can simply restrict your group members using this feature of Send Messages which give the power to send messages only into the group. 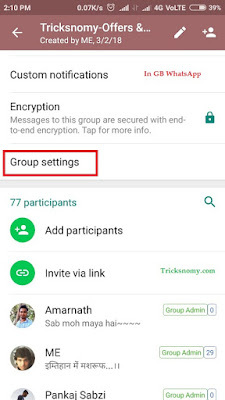 Just update your WhatsApp version to the latest version of the WhatsApp and go to Group> Group Info> Group Settings> Send Messages> Select Only admins option and done. You are ready to rock now! So if you haven't got this feature update of banning members from posting messages into your WhatsApp group and want this feature right now then you can use the GB WhatsApp app trick to enable ban member from sending messages. By using this you can create a WhatsApp group where only admins can send messages. This will surely help you to manage your WhatsApp group like Telegram Channel. Where subscribers can see only messages but can't post anything. WhatsApp is also adapting feature from Telegram and it is one of them I guess. Can you send pic of gb whats app ? I have given the same GB WhatsApp Link in the post. Please check it..
Options are there.. Just tap group name and check there "Group Settings" and then scroll down. You'll see those options. Yup anshita Ma'am ! We all are facing such issues from past few days. Due to some bugs in Either GB WhatsApp or Official WhatsApp. 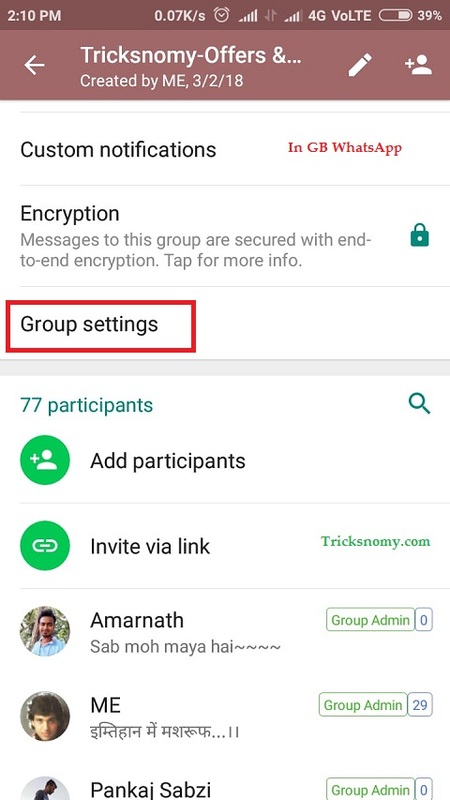 group setting is not showing is group..
Open GB Whatsapp Tap on Group name and then again tap on Group name. Scroll down and you'll see there. bro.... group setting option not show in my GB whatsapp group infomation page for me why???? Read the above comment ! I think WhatsApp has removed this feature as of now. That's why people are facing "Can't change setting error" in GB WhatsApp. WABETA official Twitter handle has confirmed this. So this feature of "Only admins can send messages" will be available for upcoming official WhatsApp. Its working for me Thanks a lot. Ravi K Agrawal Ji. Thanks for Confirming this that this method is again working for you !! I am only one concern that it this APK is secure? Ravi K Agrawal Ji. Any Modded Apk is not secure. It's like taking a chance with your privacy for some extra features. In this post itself I have mentioned it not to use this APK for your Personal Chat. You can only take the help of activating this "Only admins can send messages" feature before rolling out officially !